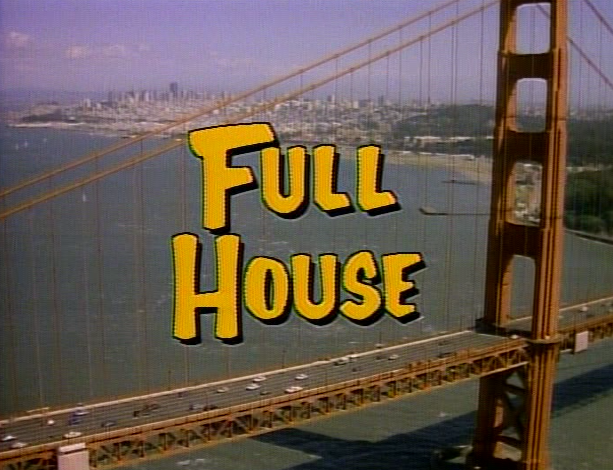 There are quite a few Full House holiday episodes. I've written about the 1988 episode "Our Very First Christmas Show" before. That Christmas story included actor Sorrell Booke (that's J.D. Boss Hogg to you and me). However, when I recall Full House Christmas episodes, this 1994 installment is the one that stands out the most in my memory. 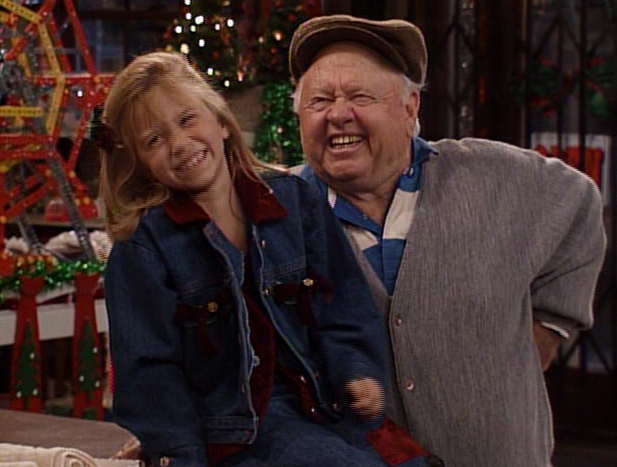 Who could forget the year Mickey Rooney came to spend Christmas with the Tanner family? What's so bad about a Christmas necktie that doubles as drink holder? In 1994's "Arrest Ye Merry Gentlemen," young Michelle is eager to give her father the first Christmas present she's ever purchased. When she discovers that her Aunt Becky is intending to give the same gift--one the other members of the family openly mock--Michelle begs her Uncle Jesse to take her back to the store to exchange it. Although he is cranky, tired of the lack of Christmas spirit in everyone he has encountered this Christmas Eve, Jesse eventually agrees to Michelle's request. Preschoolers Nicky and Alex think they see Santa Claus trying to harm DJ and Stephanie! Meanwhile, Uncle Joey has returned from the dry cleaners with his Santa suit, excited to surprise young Nicky and Alex later that night. Unfortunately, the suit doesn't fit--and the impressionable toddlers overhear Joey moaning and groaning while trying to squeeze into the small sized costume. Terrified of the Santa Monster, the young twins are no longer looking forward to meeting St. Nick! This hilarious B-story bolsters this episode to make it one of the strongest Christmas stories of the series. 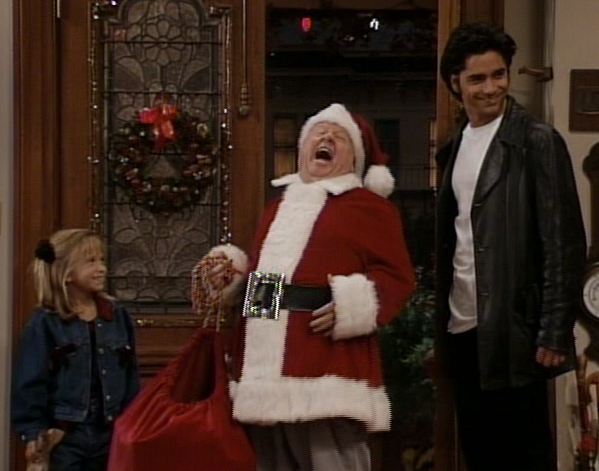 Uncle Jesse is once again impatient with others on Christmas Eve. 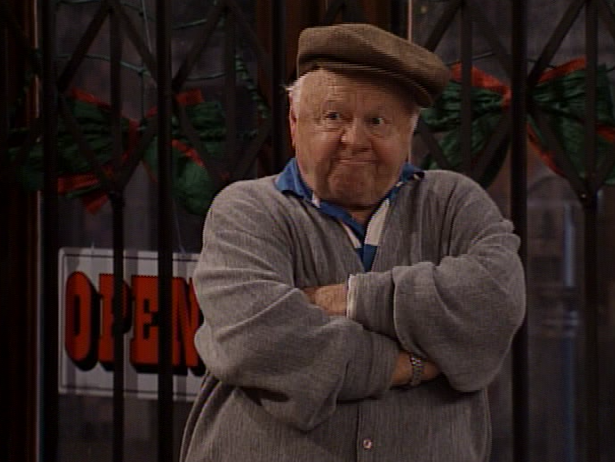 When Michelle and Jesse arrive at the joke and novelty shop to return her unwanted Christmas present, the store owner Mr. Dreghorn (played by veteran actor Mickey Rooney) is just closing up and refuses to open the door. After talking their way in, Mr. Dreghorn doesn't want to bother with making a return--and Jesse tries to convince him to exchange the merchandise. Pushed beyond his limits, Mr. Dreghorn locks the front door and claims to have pushed the silent alarm for the police. Yes, Jesse and Michelle are being held hostage on Christmas Eve by Mr. Dreghorn! Held hostage by Andy Hardy!? This family sitcom has not exactly created a nightmarish situation. This madman is Mickey Rooney after all--he's a scamp, not a slasher. More revealing, Rooney's Mr. Dreghorn has a twinkle in his eye and easily lands all his comical jabs against Uncle Jesse. (Dreghorn mostly pokes fun of the well coiffed Uncle Jesse--a well-worn source of comedy on the series. My favorite insult is when Dreghorn refers to Uncle Jesse as Fonzie. With his slicked back hair, white tee, and black leather jacket--the barb is a solid strike). Although Uncle Jesse begins to panic, Michelle knows how to read the situation. Michelle also laughs at Dreghorn's insults lobbed at Uncle Jesse as he fumes about his crisis. Locked in the store for awhile, Jesse eventually recognizes the police haven't arrived yet. He tries to reason with Mr. Dreghorn for their release, claiming that the Tanner family is waiting for them to return for the the big holiday celebration to begin. But Michelle sees what Uncle Jesse doesn't--Dreghorn isn't in any hurry. Perhaps Dreghorn doesn't have a party he's missing or a large family who are waiting on his arrival? Their mother Becky reads "Twas the Night Before Christmas" to the twins who just hope the nightmare will end! Back at the Tanner home, Danny's little talk about Santa Claus with Nicky and Alex doesn't go as well as intended. After explaining that Santa sees them while they're sleeping and sneaks into the house on Christmas Eve, the boys are more terrorized than before. Can you blame them? Have Mercy! By this 8th season episode, Uncle Jesse's mullet is gone. 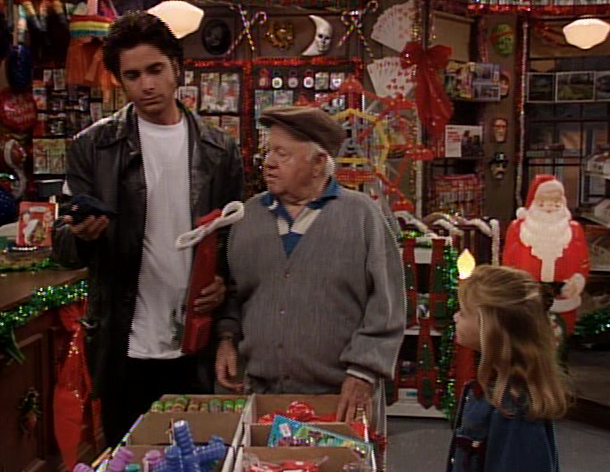 Michelle urges Uncle Jesse to invite Mr. Dreghorn to come home with them for Christmas. Sure enough, the lonely old man was just looking for some company on Christmas Eve. Uncle Jesse has to apologize for his behavior as well--finding blame in everyone else when he lacks the Christmas spirit. You're not surprised by a happy ending, are you? 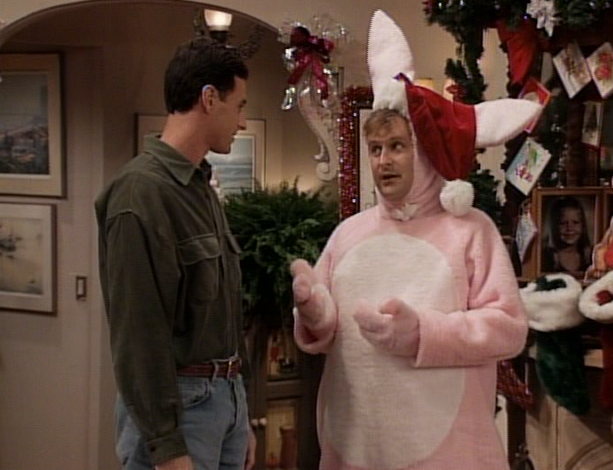 What--no holiday armadillo suit in your closet, Joey? Nicky and Alex are eventually coaxed into welcoming Santa when Joey has the bright idea to dress up in a pink rabbit costume. Who could be afraid of the Christmas Bunny? Dreghorn joins the Tanner family for a merry Christmas--or was it? Of course, if you want to read the tone of this Christmas episode as a horror story--locked in and held hostage by Mickey Rooney--I think you should go ahead and make yourself happy. Diff'rent Strokes for different folks, right? Wait--no, that's another sitcom. Sorry. But if you like Christmas horror stories, you probably already know about Mickey Rooney in the cult favorite Silent Night, Deadly Night 5: The Toy Maker. This 1991 camp Christmas classic features Rooney in the title role with a few twists that will leave you wanting to see Deghorn played a bit more ambiguously dark. If you haven't yet seen SNDN 5--what are you waiting for? Sure, you call Rooney a scamp, but if you've seen him in _The Manipulator_, you've seen he can play a psychotic well! As someone who likes crossovers, I'll have to watch this episode and see if it can "count" as Mickey playing Kris Kringle again.